The phone rang at 6:02 on Tuesday morning. Before I could even open my eyes I thought, “It’s not good news”. It’s never good news when the phone rings that early in the morning. As I struggled to come fully awake, I heard my Mom’s voice telling me my grandfather had passed away. He had lost his battle with liver cancer. They say, sometimes, when you know it’s coming, bad news like this is easier to hear and process. They’re wrong. My grandfather was Kenneth Bailey, although he was always Papa (“pa-paw”) to me. He was born in 1928 and lived his entire life in Buford, Ga. He was married to my grandmother (Mema) for 61 years. He has two daughters, four grandchildren, and five great-grandchildren. And while all of those things are true, they really don’t get to the heart of the man that Papa was. When I think about Papa, so many things spring to mind. I remember him in the kitchen. 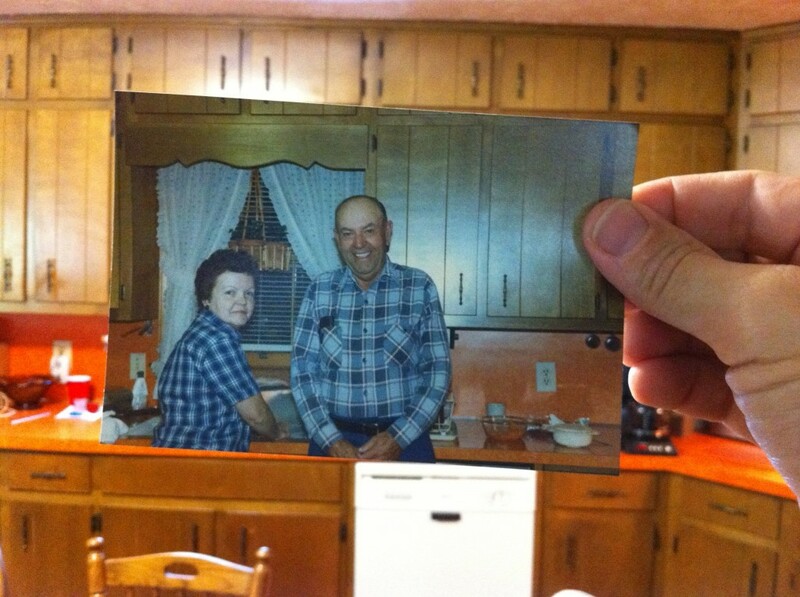 “Dinner at Grandma and Grandpa’s” house may be a cliché for many, but for us it was part of growing up. Easter, Christmas, Thanksgiving, graduations, or just a nice Sunday afternoon – we spent a lot of time in Mema and Papa’s kitchen. Whether it was his famous Coca-Cola pressure-cooked ham, his biscuits, or his delicious fried potatoes, there was usually something good from Papa on the kitchen table when we got together. The first Thanksgiving I spent away from home at college, my brother came to visit me and brought me ham and potatoes that Papa had fixed. It was just what I needed. He gave me my first job the summer I turned 13 – helping him lay gas pipe for the city. I’m sure there are mountains of rules and regulations that would prohibit him from letting me help him today – but back then he just loaded me in the truck, and off we went. I don’t know that I really learned much about laying gas pipe that summer, but he taught me the value of an honest day’s work. Papa was a good and selfless man. He was a steady man – slow to anger and quick to offer help. If you wrecked your new car 2 weeks after getting your driver’s license, he would be there to help you and your dad fix it in the shed down behind his house. If you needed to borrow his truck to move out of your apartment, you just needed to pick up the phone. If you needed a tool – any tool – he probably had one in his basement. He was a man who loved to work with his hands. If he didn’t know how something worked, he would take it apart and figure it out. After he retired, he kept up a steady business fixing up and selling old lawnmowers out of his house. When my brother and I were younger, he built us a go-cart and cleared off a track in the backyard to drive it on. I’ll never forget the day the exhaust pipe loosened up, and fell over onto the throttle – sending my brother careening full speed into the corner of the house. Through all of those family gatherings, adventures (and misadventures), and calls for help – Papa was always there. Always. I can’t remember a single time when he wasn’t there to lend a hand or just a few words of support. Its part of what made him special, and one of the many lessons we all learned just from being around him. As I mentioned, Papa had recently been diagnosed with liver cancer. About a month ago, my Mom called to let me know that the prognosis was not good. The cancer was just too aggressive and it looked like his liver was not able to keep up with his body’s needs. She told me I needed to think about coming home to see him. It kept running through my mind, on a constant loop, no matter what I did or what I tried to concentrate on. It pushed out all thoughts of work or schedule or responsibility. I knew that the only real responsibility I had at that moment was to get back home to see Papa. It was never really a question of if I would head back home, but how quickly. I came home that night, talked it over with my wife, then made reservations to fly home for a long weekend – to say goodbye. My trip to Atlanta, and subsequent trip back home, were riddled with delays, cancellations, rude airline employees, and missed connections. Still, that Bobby Pinson lyric kept playing in my mind and I kept pushing forward, determined not to lose sight of why I was travelling. Looking back now, I had the fortune to get home on one of Papa’s last good weekends. Up until the very end he would still get up each day, shower and shave, get fully dressed (including shoes and socks), and come sit out in the living room. 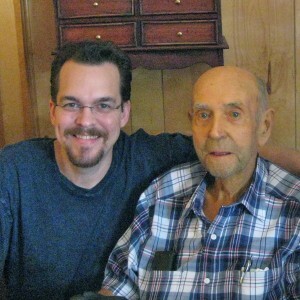 For those few days I was home, I got to visit with Papa – really visit. He still felt like telling a few stories. He would still laugh and smile at a good joke, and would still join us at the kitchen table to eat. As the hour drew close when I would have to leave for the airport, I tried to fix each moment in my mind. I tried to will the clock to slow down and let me have a few more years time with Papa during those last minutes. When the appointed time came, I gave him a hug, told him to take care of himself, and told him I loved him. I fought back tears and headed outside to the car. It was the last time I saw him. After I left, Papa went down hill pretty quickly. I’ve never been prouder of my parents than during the last few weeks of Papa’s life. They dropped everything to be with him and Mema. They took them to doctor’s visits, they kept them company, they did things around the house, they kept everyone fed. They did anything and everything my grandparents needed without question and without complaint. For that last week, they essentially moved in with my grandparents to help them around the clock. Papa had always been there for them – and now they were there for him. After that early morning phone call last Tuesday, things happened quickly. We packed our things, made arrangements for our trip, boarded the dog, got the kids after school, and headed back to Atlanta. It was a very long drive, in more ways than one. It gave me plenty of time to think and remember Papa. I was glad to finally get home on Wednesday and give my Mom, my Dad, and Mema each a big hug and tell them how much I loved them. Some things you just can’t do over the phone. The funeral was beautiful, if you can call a funeral beautiful. Even at 3:00PM on a Friday afternoon, the chapel was packed with family and friends. Papa touched a lot of lives and the respect everyone came to pay him affected me deeply. As I watched my wife comfort my crying son, I realized my children were never going to really know Papa the same way I did. Listening to the preacher talk, I prayed that they would come to know some measure of the man he was through me, and what he taught me. Perhaps the most important lesson he taught me was during his final weeks. When the doctors told Papa the prognosis wasn’t good – he made peace with it. He went home, made his arrangements, and spent every one of his last days with his family. I don’t know if he was afraid of dying, but I don’t believe he was afraid of death. He knew where he was going and he knew that what lay ahead was far better than anything he had ever experienced here on earth. His death, for us, was an ending – but for him it was a beginning. It wasn’t that he didn’t want to live – he did. He fought hard until the very end. He just knew that there was more to life than life here on earth. The preacher put it better than I ever could at the funeral, when quoting the 23rd Psalm – “Yea, though I walk through the valley of the shadow of death.” He pointed out that it says “through” the valley, not “to” the valley. Death isn’t a destination – it’s something you pass through, a stop along the journey. And once you pass through that valley, you are promised something glorious on the other side. After the funeral, we spent the afternoon with Mema, then most of the next day. As I sat there at the kitchen table, preparing to head back home, I could see the house was still bustling. The family was all there – my aunt and uncle, my cousin, my brother and his family, my parents, my wife and kids – my grandmother. All five great-grandchildren were running around, loudly playing, and reminding us all that life goes on, and one generation always hands the torch to the next. As we all sat around the kitchen table and reminisced about Papa – we shared a few laughs and a few tears. It struck me that while there was still life resonating around the table, there was no doubt something was missing. Well, maybe not missing – just different. Papa wasn’t there, and it just didn’t feel right. Thank you Papa for all the love and support you gave me over the years. Thank you for giving me a good example of what it means to live your life to the fullest, to be faithful to your promises, and to love your family with all your heart. Thank you for being you, and sharing your life with us all. © 2011 – 2019, The Word Zombie. All rights reserved. Beautiful Mitchel. He sounded like a wonderful man. Made me miss my own Granddaddy Johnson. Peace be with you and your family. This brought tears to my eyes, having gone through similar experiences with 2 grandfathers, 1 grandmother and my mother…all taken from me because of cancer. It sounds like you had closure with your Grandfather and that he was able to instill many positive values in your life. All we can ask is that we have made an impression on those we love and that impression moves them to celebrate your life and laugh and cry about you after you are gone. Thanks for sharing, be well. Thank you so much for the kind words. I really appreciate them. Wow! Another great one! I miss Kenneth too. Have so many great memories of him from as far back as I can remember. When Daddy died his hugs were even bigger every Sunday morning at church, I know he was trying to feel some of the void. Will never forget one of my last visits with him I took our supper from Cracker Barrel to eat at the famous kitchen table and he actually ate and enjoyed….But, nothing like I enjoyed his famous chicken livers he cooked and always remembered me when he did. So wish I had have learned how he cooked them. I have never eaten any that compared to his. We are both so lucky that God blessed us with the families we have and for the kitchen table memories.